Our eyes are perhaps our most delicate and sensitive organs. They are at high risk for damage. By the year 2030, more than 66 million Americans will be at risk for common eye diseases. Diabetic retinopathy is the leading cause of blindness for Americans under 60. Diabetics are 25 times more at risk for blindness than the general opulation. 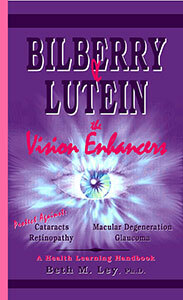 Bilberry and Lutein are clinically proven to help protect against, slow down the progression of and even help reverse these and other common vision disorders. Get the facts on these powerful antioxidant vision enhancers!